Last year, Alibaba raked in a total RMB105 billion (US$25 billion) in revenue on Singles’ Day (also known as the 11.11 Sale), recording a massive 39 percent increase in sales when compared to 2016. The massive sales period in China has found its way into Southeast Asia today to become one of the most important digital sale periods of the year. Malaysia is definitely not excluded from the sale extravaganza, as we have seen the launch of various Singles’ Day sale campaigns by the country’s top e-commerce players. As such, this has sparked much interest from consumers across the country. By analysing Malaysians’ search trends on Google, we could see that interest on the keyword “11.11” begun mid-October 2018, more than two weeks prior to the sales period. The interest in the sales period was probably influenced by big e-commerce brands such as Shopee and Lazada who introduced their sale campaign between 23-30 October. On 2 November 2018, Malaysians witnessed the introduction of the Digital Tax at the annual federal budget announcement. 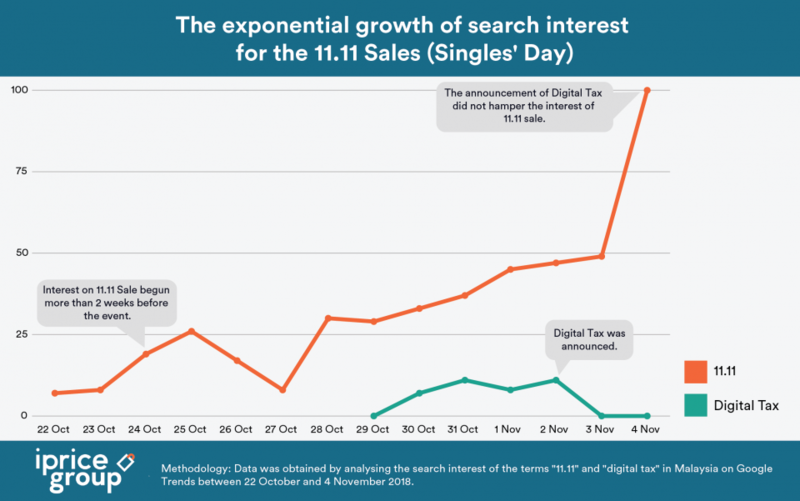 The announcement sparked a rise of searches on the new tax scheme on 2 November. However, it did not hamper consumers’ interest in the 11.11 Sale. This was evident on 3 November as search interest for “11.11” peaked at its highest point after the Budget 2019 announcement on the previous day. This year’s Singles’ Day sales also saw an added emphasis in mobile-specific promotions as well. By analysing Malaysia’s five most visited e-commerce platforms, we saw that 4 out of 6 online players offered in-app promotions and flash-deals specifically for mobile users. Among them is Shopee, who introduced in-app games which required users to play games at specific timings to create a sense of urgency for the sale. The emphasis on mobile is really vital as Southeast Asia (SEA) is a mobile-first region unlike any other consumers in the globe. In a research on the state of e-commerce in SEA, it was noted that 72% of all online traffic now derives from mobile devices as of 2017 and this figure is expected to be higher today. 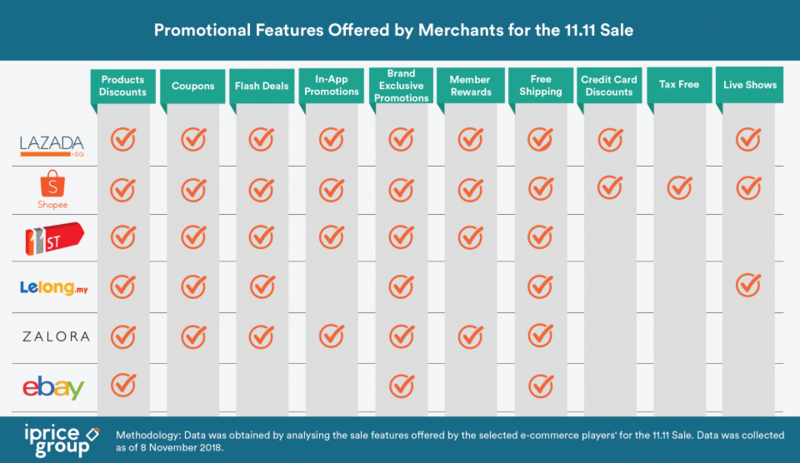 With many players leveraging this sale period for their businesses, the 11.11 Sale also saw the introduction of unique features by top players in the industry in a bid to stand out from its competitors. Among them is Lazada, who will stage a live star-studded 11.11 Super Show at the Axiata Arena. The show will be aired on multiple broadcasting channels, online streaming app and on its online shopping app. Lazada’s extravagant live show for Singles’ Day mirrors Alibaba Group, who holds a similar live show for the same sales event in China as well. This is no surprise as the Chinese e-commerce giant recently doubled down on Lazada in 2018 with an RM8 billion (US$2 billion) investment and installed Lucy Peng, a founding member of Alibaba as Lazada’s new CEO. A similar approach was emulated by Shopee and Lelong as well where unique product offers are made available through live videos streamed on Facebook. Other unique features which has gained much popularity amongst top e-commerce players are flash sales, brand exclusive, and tax-free promotions. Based on our previous research, the final quarter of the year is the most important period for e-commerce players. While the 11.11 Sale is among the most popular online sale events, top e-commerce players should expect to obtain more online traffic and revenue in the month of December through the 12.12 Sale and the year-end sales. This was evident in 2017 when we conducted a study to ascertain the most popular online sale period of the year. 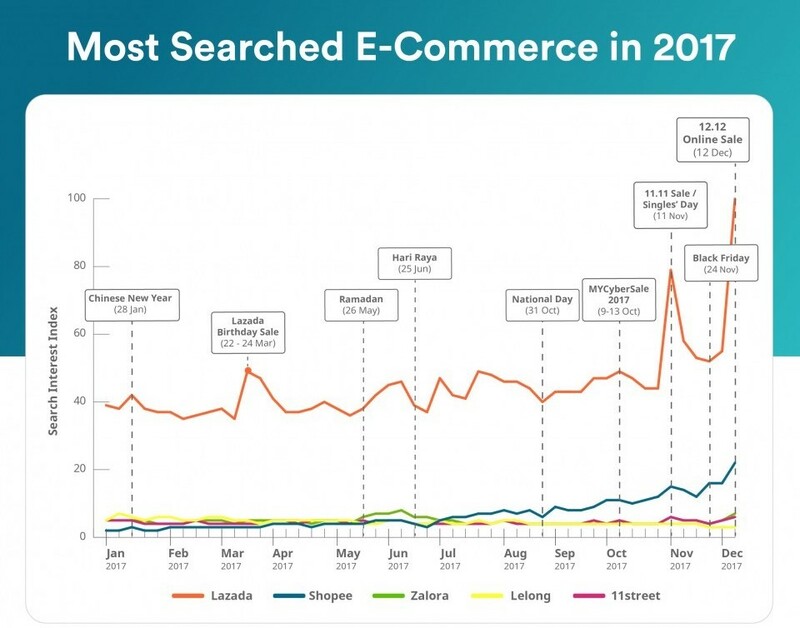 Although the 11.11 Sale did garner much interest, the 12.12 Sale gained more popularity and was the most searched online sales event of the year. This trend is expected to grow exponentially in the years to come with the ever-increasing interest in the world of online shopping.